Frankie Dupont and the Science Fair Sabotage is the third book in the Frankie Dupont series. This time around, mom and dad are going away for the weekend, leaving Frankie in charge of the detective agency. 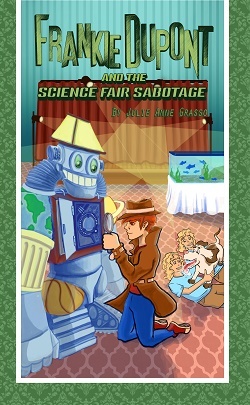 When he is called to the Sustainable Science Fair, he finds Angus and Archie in angst over their robotic chip, stolen sometime after arriving at the fair. Frankie swoops into action. He finds the twins entry into the fair, or rather just the twins, causes equal angst among the other student entries. Angus and Archie have pranked each of the contestants and none of them are friendly toward the boys. Each contestant has a reason to sabotage the twin’s entry, though none will admit they stole the chip. Frankie becomes more confused the longer he tries to figure out the culprit. 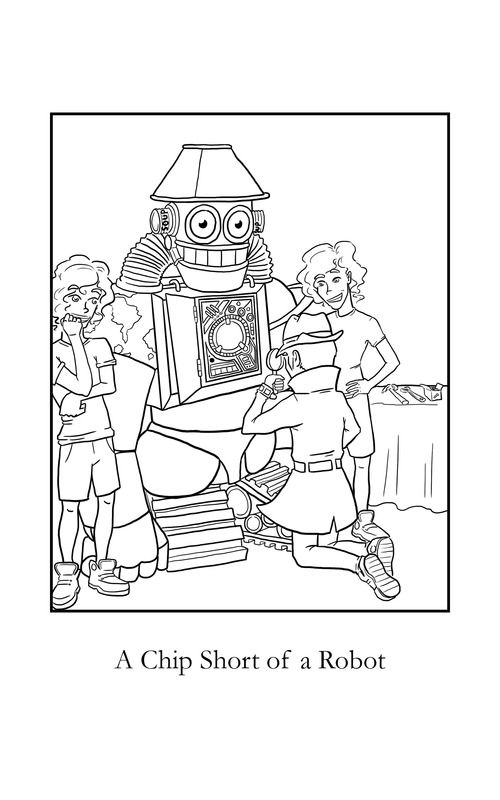 If each kid had a reason to take the robotic chip, how does he decide which is the guilty party? The mystery is not terribly complicated, still Grasso, whose writing improves with each new story, does a great job keeping the reader with Frankie. Kids will not figure out the culprit much sooner than Frankie will. After three outings, the characters remain fresh. Frankie has lost the arrogance he had during the Lemon Festival Fiasco, yet he is still clueless regarding Amy’s admiration. Frankie’s best friend and cousin Kat, who has been his sidekick through the first two stories, is less involved in the mystery of the stolen chip. 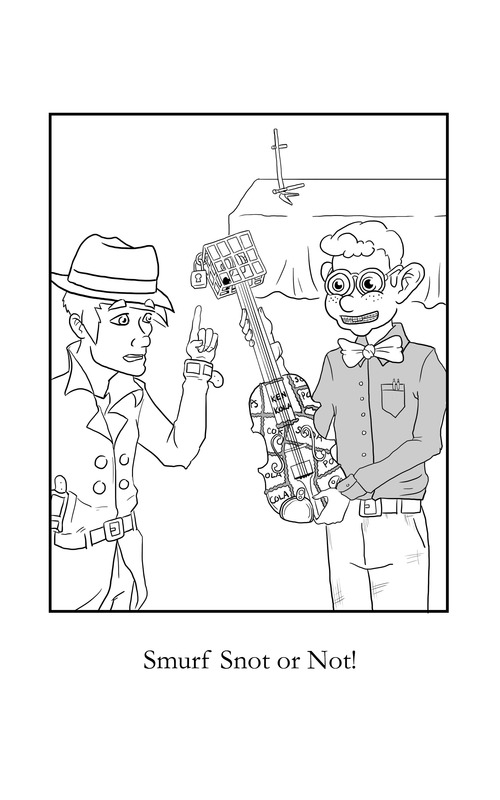 Frankie’s main motivation comes from Inspector Cluesome, whom Frankie is determined to outwit. Kids will enjoy the Science Fair Sabotage. The science fair projects are interesting. One has a house built out of stevia-made sugar cubes and another using scrap aluminum to build a working guitar. The ideas of conservation and recycling are clear in the science fair entries, though I would have liked to have read more about why this fair came about, which could have lead to an indepth conversation about these important issues. The Science Fair Sabotage will entertain readers. The short chapters, divided by student entry, will keep reluctant readers interested. The end works out fine, with Frankie finding the culprit, the science fair going on as planned, and a winner announced. The culprit is not who readers will expect, so keep you eyes peeled to the clues. The Science Fair Sabotage is a fine addition to the Frankie Dupont series. Next up for Frankie, Kat, and Amy (seems they might have become a team), is a luxury cruise in Frankie Dupont and the High Seas Adventure, scheduled to release in September 2015. FRANKIE DUPONT AND THE SUSTAINEABLE SCIENCE FAIR. Text copyright © 2015 by Julie Anne Grasso. Illustrations copyright © 2015 by Alexander Avellino. Reproduced by permission of the publisher, Julie Anne Grasso, Australia. Buy The Sustainable Science Fair at Amazon —Book Depository—Author’s Store. Learn more about The Sustainable Science Fair HERE. Free Activity Booklet is HERE. Full Disclosure: Frankie Dupont and the Sustainable Science Fair by Julie Anne Grasso & Alexander Avellino, and received from the publisher, Julie Anne Grasso, is in exchange NOT for a positive review, but for an HONEST review. The opinions expressed are my own and no one else’s. I am disclosing this in accordance with the Federal Trade Commission’s 16 CFR, Part 255: Guides Concerning the Use of Endorsements and Testimonies in Advertising. I have not read this detective series, but it sounds like something my great granddaughter would love. In fact, your great review drew me into the story! You write excellent reviews. Thank you. This means a lot to me, coming from you. Thank you! I’m pretty sure I’d be a step or two behind Frankie. I’m not good at solving mysteries. Usually I just wait for Mom to help me. I think I understand. I played catch with the older dog I am adopting and she much preferred the squeaky noise of a toy than the actual toy. Well, thanks again for a thoroughly enjoyable story. The characters are really developing well. I especially cannot wait for the next story on a luxury cruise ship. I love cruising.